This article will hopefully explain the difficulties associated with photographing under fluorescent light and advise on how best to deal with the problem. Fluorescent light bulbs emit photons as electricity excites the atoms inside them. Our homes and businesses are powered by alternating current (AC). 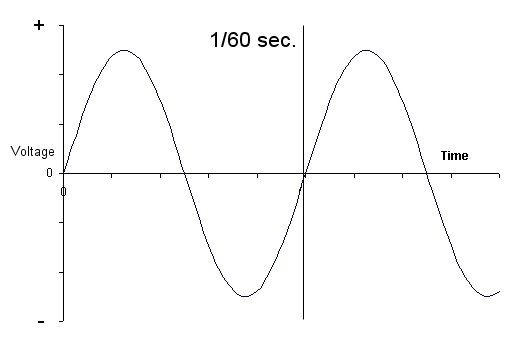 This type of current is continually reversing polarity in a cycle known as a sine wave, illustrated in this graph. As the current goes from zero to positive to zero to negative and back, the changing voltage causes the excited atoms in the fluorescent tubes to emit light of different intensity and different wavelengths. This results in a light source of continually changing brightness and color temperature. In the US and Canada, the electrical current alternates at 60 cycles per second (60hz), or one cycle every 1/60 second. During each cycle, two pulses of light are emitted, one during the positive portion of the cycle and one during the negative portion. If your camera's shutter is open for less than 1/60 second, light from only part of the cycle will be recorded by the image sensor, and you never know what part of the cycle you'll catch. At 1/240 shutter speed, for example, you may catch a pulse of light at its peak intensity and highest color temperature, resulting in an overexposed, blue-toned image. Or you might catch the middle of the cycle where the light output is dim, resulting in an underexposed, orange-toned image. "No worries!" you say. "I shoot RAW, so I can adjust the exposure and white balance with my RAW converter to make it right." Sorry, but it ain't that easy. The problem is that at fast shutter speeds, the second shutter curtain begins to close before the first curtain is fully open (this is why your camera has a maximum shutter speed for flash). As the shutter curtains follow each other across the frame, different parts of the sensor are exposed at different times. So different parts of the image will be illuminated by light of varying intensity and color temperature. This makes for some truly ugly images, and even if you're a Photoshop master, it's no easy fix! Adding more fluorescent fixtures won't help, either, since they are all powered by the same current and therefore synchronized with each other. These four images of a sheet of white paper (with a bug crawling across it) are from a four-shot burst at 1/320 shutter. 1) The fastest shutter speed you can use is 1/120 (1/125 is close enough). Theoretically this will catch precisely 1/2 of a cycle, with all parts of the image illuminated by the full spectrum of output by the lamps. 2) The second fastest shutter speed you can use is 1/60, to catch a full cycle. This should give consistent results. Use Tv or Manual mode. You want to avoid 1/100 or 1/80. 3) Multiples of 1/2 cycle, i.e. 1/40 (1.5 cycles), 1/30 (2 cycles), 1/20 (3 cycles), etc. We're now in tripod territory, but anything slower than this should also work fine. 4) Overpower the fluorescent light with flash if you can. Set your shutter at flash sync speed, get as close to your subject as possible, and stop down until the maximum flash distance is not much more than your subject distance, forcing the E-TTL flash metering to maximize the light output. 5) Since fluorescent tubes vary in color temperature, a custom white balance is recommended, using the same shutter speed guidelines listed above. Here is a four-shot burst of the same sheet of paper at 1/60 shutter with the same custom white balance. A caveat to non-US readers: In Europe, the current alternates at 1/50 second. The above speeds would need to be adjusted accordingly (1/100, 1/50, 1/25, etc). We can't always control the lighting conditions we shoot in. But by understanding how both cameras and fluorescent lights work, we can maximize the quality of the images we capture in those conditions.